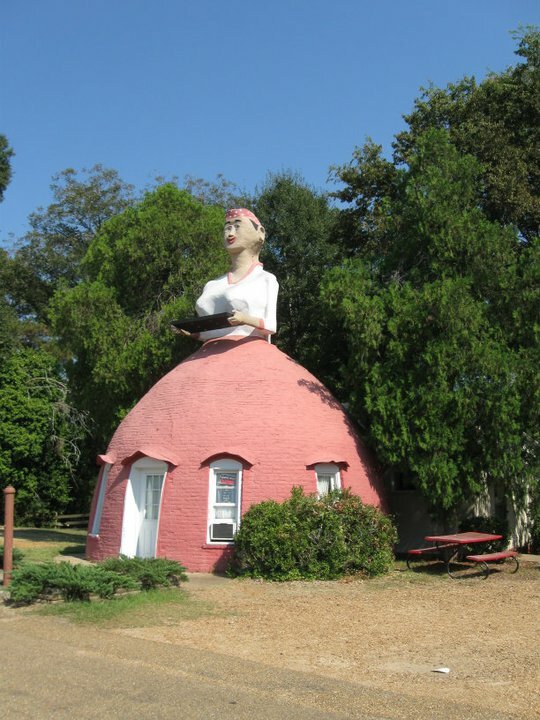 Visitors who travel to Natchez, Mississippi, by way of Highway 61 will be able to see an interesting relic of roadside architecture known as Mammy’s Cupboard. While some visitors just want to stop and photograph the building, locals go there because it’s a great place to get a meat and three and a slice of banana caramel pie that by itself is worth the five-mile drive from town. For others, the building’s association with a “southern mammy” is enough for them to keep on driving. Built in 1940, Mammy’s Cupboard originally operated as a family-owned Shell Gas station and convenience store. It was a good investment at the time. The Natchez Pilgrimage, the spring tour of the town’s antebellum mansions, had grown exponentially since it began in 1932. Tourism to the town exploded following the enormous success of Gone with the Wind, which premiered in 1939. Many Americans who saw the film later went in search of houses like Tara;Natchez offered them that and more. Today, the gas pumps at Mammy’s have been closed off, but it remains a family-owned restaurant that is primarily open for lunch. 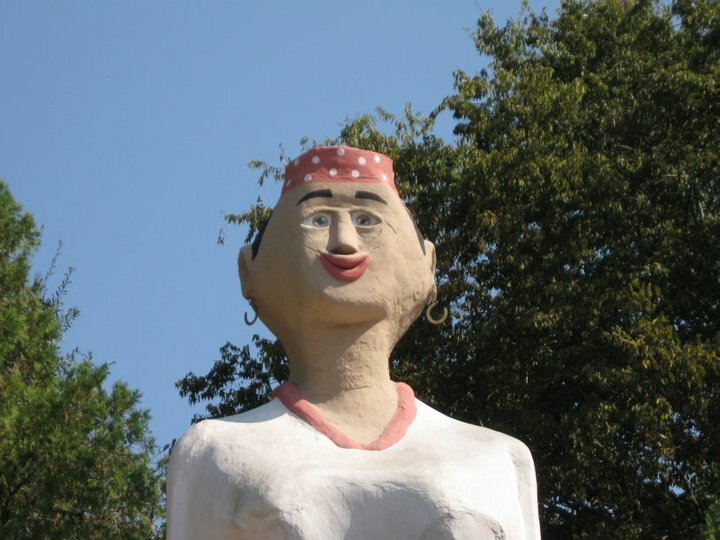 White tourists, of course, were drawn to the Natchez mammy from the beginning. By 1940, Aunt Jemima–a marketing figure based on a southern mammy–was already the most recognizable advertising icon in the country. She reminded whites that this kind of happy servitude was still within reach. 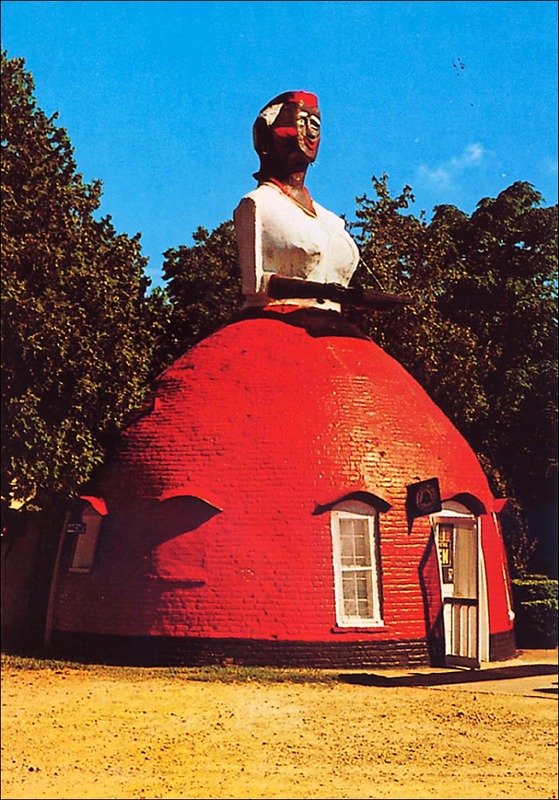 For African Americans, mammy icons were a reminder of their second-class status. 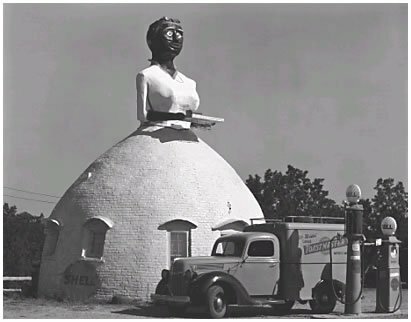 In the more than seventy years that Mammy’s has been open, her skin tone has grown lighter in appearance–more white than black. She was still rather dark in the early 1990s, but has since become very fair–perhaps a tacit acknowledgement by the owners that the dark skin was at best inappropriate, and worse, an offensive reminder of the not-too-distant past. Thanks, Beth. The food is really awesome. That banana caramel pie. . .oh, that pie. Thanks for posting. Wasn’t aware that Weston photographed Mammy’s.